As some of you know (or if you don’t read this through RSS and “enjoy” my little banner add down there in the sidebar), I run a project called Working-Knowledge. 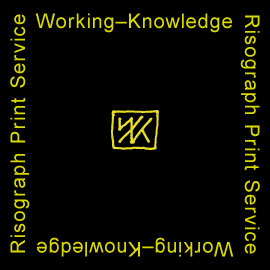 It’s a small print operation that uses a Risograph press. One of my favorite and most frequent collaborators is Bryce Wilner. He’s an amazing illustrator and designer that puts out more self published books than I thought was possible. Foodcrypt is food-culture as observed by Chris Roeleveld and Sam Cholke.